Our research explores how businesses on the high street can impact the health of the public and includes league tables ranking the 'unhealthiest' high streets across London and the UK. Proliferation of high street payday loan shops is a result of the withdrawal of ‘mainstream’, high-street-based financial service structure (Fuller et al, 2008) and the introduction of flexible changes to premises function. Payday loan shop employees to receive training in identifying and sensitively signposting customers who may be at risk of physical and mental health problems. There are estimated to be over 34,000 machines in UK. Introduction of cigarette-style health warnings for bookmakers which do not make efforts to make their offer more health promoting. Typical fast food meals are energy-dense and served in large portion sizes. Government to make calorie and nutritional labelling in fast food outlets mandatory. Research that suggests 9 out of 10 of sunbeds emit ultraviolet radiation levels that exceed current safety limits. Introduction of cigarette-style health warnings for businesses which do not make efforts to make their offer more health promoting. Presence of head shops on high streets normalises drug use. Increase youth awareness of the risks of NPS through education in schools. Social isolation is a key trigger for mental health problems which are experienced by 1 in 4 people in the UK each year, and supportive social relationships improve mental health, health behaviour, physical health and reduce mortality risk. A Medical Research Council study has noted the positive effects on mental wellbeing of men who felt able to ‘open up’ and talk about their emotions specifically in the pub context. Libraries contribute significantly to bibliotherapy, defined as the use of books as therapy in mental health treatment, as access to books and reading as a form of self-help leads to substantial long-lasting improvement in people with social anxiety disorder, depression and low self esteem. The presence of these services on the high street makes them accessible to the wider community and research has found that distance is the strongest barrier to accessing health centres and surgeries, meaning that their presence on the high street positively impacts on the health of that community. Estimated that 95% of people visit a pharmacy at least once per year and an estimated 99.8% of people from the most deprived areas live within just a 20 minute walk of a community pharmacy. Leisure centres are often used as a setting for health promotion campaigns, advice and messages, and often host community groups for mothers and toddlers, school children and the elderly. High streets are an important part of vibrant communities and a critical engine for economic growth in local areas. In this regard high streets have ban important role to play in supporting the public’s health. 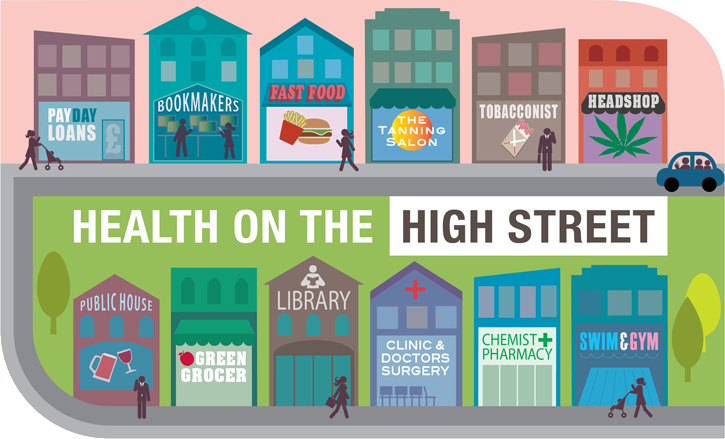 A healthy high street can provide the public with healthy choices, support community cohesion and social interaction, promote access to health services and do much to support individual wellbeing. In 2007, smoking in enclosed public spaces in the UK was banned. This landmark step has reduced smoking-related harm, but we can and must go further to help the UK kick the habit for good.